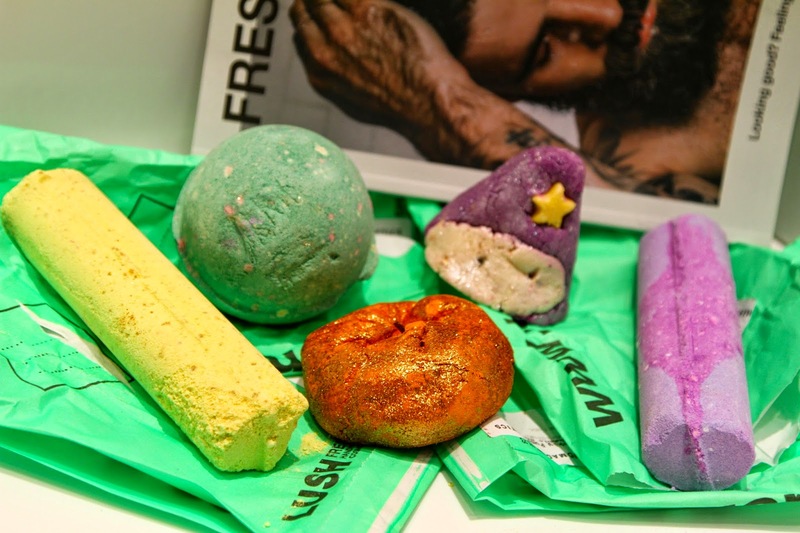 For Halloween this year I thought it was only right to do a halloween themed post, and what better than the amazing selection of Lush themed products! Look at them! I think this year they have done so well with what they’ve brought out to the shelves. I couldn’t help but buy every themed item they had so here they are, this years 2014 Lush Halloween Collection. 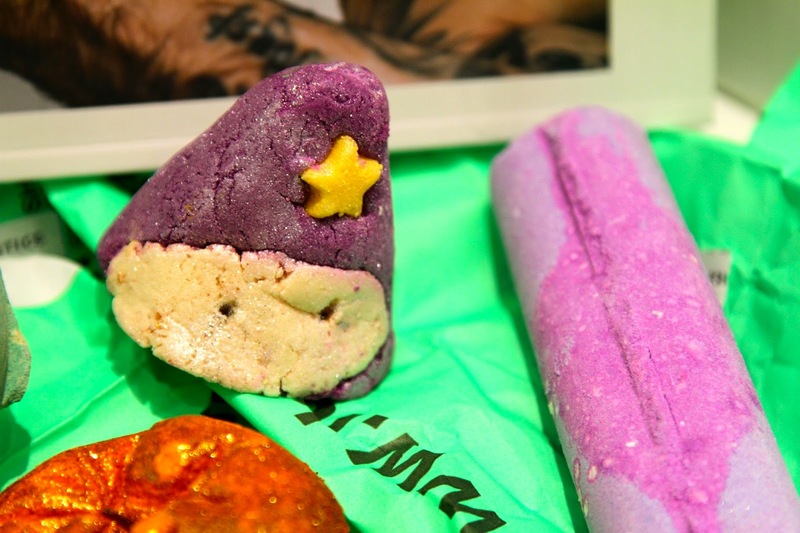 First of all I picked up my favourite out of the selection, the Wizard Bubble Bar. This little cutie can be used over and over again as only a little bit can create so many bubbles. If anyone doesn’t know what a bubble bar is or hasn’t used one before, basically you snap a little bit off and crumble under your running bath tap to create lots and lots of bubbles. It has a delicious orangey/herby scent to it, and also contains phenol oil which is used for cleansing and purifying. Next was the two little magic wands as I like to call them, really they are just long bath bombs that you throw into the bath and let them bubble away. I picked up Sparkler and Northern Lights. I actually love the shape of these bath bombs because they fizz away and float a lot better than your traditional circular bomb. Another great thing about the shape of these is that you can easily snap a bit off so reusing them isn’t a problem. The Northern Light bomb contains jasmine which is a favourite ingredient of mine, softening the skin and giving it that silky shine. The Sparkler contains rose oil (another favourite) and Sicilian Lemon Oil… very posh! Next is the cute little Pumpkin which I can tell you now, covers your whole hand in glitter when you pick it up. Not to mention having to deep clean your bath after you’ve used it as it looks like something from the Katy Perry Californian Dreams video. Never the less, this sweet scented bubble bar fills the room with a lime and grapefruit aroma. Yummy! Finally and last but not least, the Lord Of Misrule Bath Bomb. This has a gorgeous sweet, herby scent to it and is absolutely huge. You could definitely get at least two baths out of this one, and I will defiantly be buying a few more of these before they are taken off the shelves. 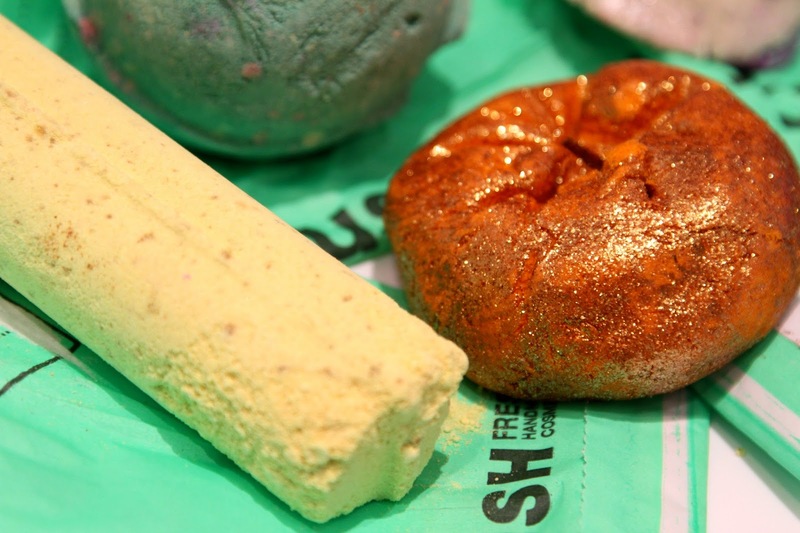 If you like the look of any of these products get yourself down to your local Lush right now because these products aren’t staying around for long! Happy Halloween everyone! If you haven’t seen already, I did a little three part skincare series last week, check them out if you need help with your skincare routines!